Isabella Stewart Gardner was a patron of the arts. Her amazing collection has become my favorite museum—The Isabella Stewart Gardner Musem in Boston. Now that it’s on LibraryThing you can browse not only her home and art collection, but also her personal library of 531 books (entered into LT in just four days). Sylvia Plath‘s library is dispersed between three major repositories, so having her collection listed on LibraryThing is great for easily access. The famous poet and novelist has 375 books on LibraryThing. Famous for her suffrage work, the civil rights leader Susan B. Anthony has 295 books on LibraryThing—drawn from the collection at the Library of Congress. Marie-Antoinette’s library is an interesting project for a number of reasons. She’s a DWEF rather than a DWAM, the library has a manageable size (736 works), and there’s a catalogue available on-line without any copyright difficulties. But maybe the most interesting thing about the library is that, like the great majority of living people’s libraries here on LibraryThing, it’s a library designed for reading pleasure. There are no heavy treatises on philosophy or theology, no law books, just piles of novels and plays, with a sprinkling of reference books and history. There’s now an “Overlap with special libraries” section on your Stats page, so you can tell at a glance whether you share Bleak House with Susan B Anthony (I do). As always, check out the jbd1, who’s taken the lead on many of the projects. Initially we were adding the authors among these literary giants as LibraryThing Authors (since technically, they are/were authors who showcased their personal libraries). People complained—not without merit—that the LT-author list is now fronted by a bunch of dead people (Ernest Hemingway and Sylvia Plath now top the list; Thomas Jefferson is further down, all the way at number 8). Fundamentally, we want the same linking going on—from author pages to profiles. But we need a new badge that’s somewhat separate. Some names have been proposed already, including “Immortals” and “Literary Luminaries”. More in this Talk topic. Thoughts? Votes? 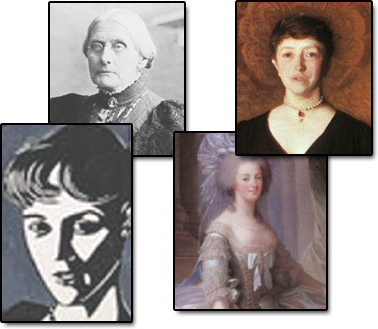 *Isabella Stewart Gardner moved to Boston when she got married, Sylvia Plath was born in Jamaica Plain and went to Smith College in Northampton, and Susan B. Anthony was born and raised in Adams, Massachusetts.